Please join us for some fun in the sun at The Balcony circuit at Willow springs Raceway on Feb 8th 2014. Save $10 on your entry fee for the ENTIRE 2014 season! Save $10 for $150+ spent on parts! You can stack your deals with each promo! Soooo A lot of peeps been buggin me about an event. So lets do this. Update: Day 1 is currently closed for registration, Sorry we have cancelled day 2! Early bird special(big help to the organization), if you sign up before April 1st 2012, drivers will be allowed one designated passenger included in their entry fee. After you have sent payment, I must have the first and last name of the passenger. 2 groups, beginners and and advance. We are bringing someone to film you drift! Sooo come show off with your pretty cars!! 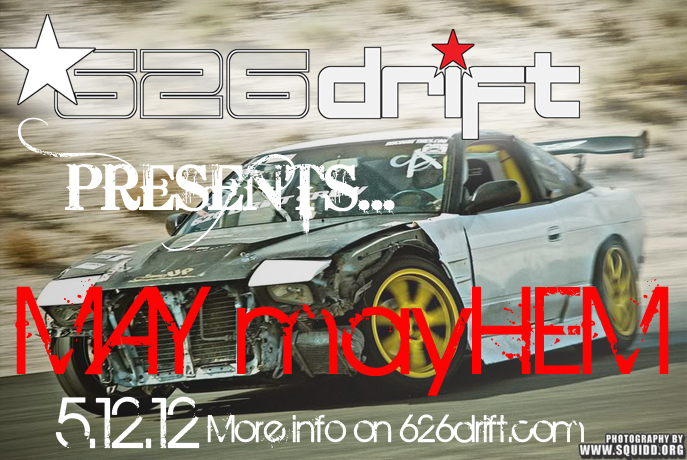 Like us (626drift) on FB for latest updates. This event is capped at 20 people. - the passenger MUST pay $5 for a voucher to sit in a car on the track. -Without the voucher/wristband, you CANNOT be in the car while drifting. -And you can NOT pay to be a passenger at the track!!!!!!!!!! Must be paid in advance. -This is for legality purposes, no gimmick to steal your money for any reason. If you have questions, please email me. Thank you and I apologize for any inconvenience. Email: Jackson at 626drift.com or just post a comment. If you are late, you are cutting into your OWN driving time. We are taking a break from 12:30-1pm for lunch. The event will end at 4pm. Help us keep the track clean, throw away your trash! Thank you and we'll see you at the track!